Suikoden II should have probably had a New Game Plus. Between the time-sensitive Clive quest, the branching endings, and the grueling decisions over which monsters to recruit, there are a lot of reasons to replay the game. Well, as it turns out, a replay-friendly feature might’ve actually been in the works. 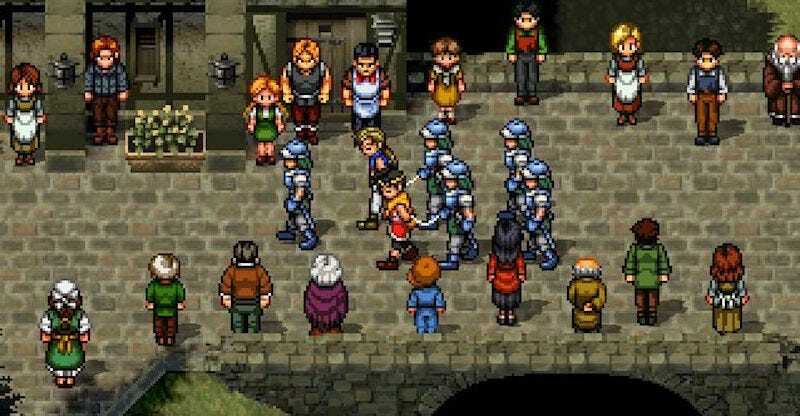 More than 18 years after the original launch of Suikoden II, players have discovered some hidden dialogue in a disassembled version of the game. The dialogue, which may be linked to an unused dungeon that a fan named Pyriel discovered hidden in Sajah Village toward the end of Suikoden II, hints at a canonical New Game Plus mode. “The world has a million forms, not identical, but not alien. The path you have followed can once again be followed in another world. While your strength remains, the path will be a new beginning. And so on. The theory, as laid out by Omnigamer, is that choosing to go down this path would send you way back to the Sindar Ruins near the White Deer Inn, where you’d get to carry over all your runes and equipment for a brand new playthrough. Maybe this time you could pick Valeria or let Ridley die. The existence of a cut New Game Plus mode helps clear up a couple of things. There are several items you can only get in the epilogue, after you’ve beaten the final boss, when there’s no reason to have them. Sajah Village also sells high-level runes in the epilogue, which signals that maybe Suikoden II’s developers had grander plans. Omnigamer theorizes that maybe with a New Game Plus you could choose to accept the Black Sword Rune instead of Bright Shield, but that seems like it’d have too many cascading plot effects to be a realistic possibility. It’s an exciting discovery that also bums me out, since Suikoden II will never get the HD remake it deserves. We’d reach out to Konami to see if they can help clear things up, but, uh, you know.